I filled out my evaluation of the superintendent over the weekend. Not going to talk about the specific outcomes here; but I was fair, thorough, and constructive. I recognized both progress and challenges and explained my thinking with depth. 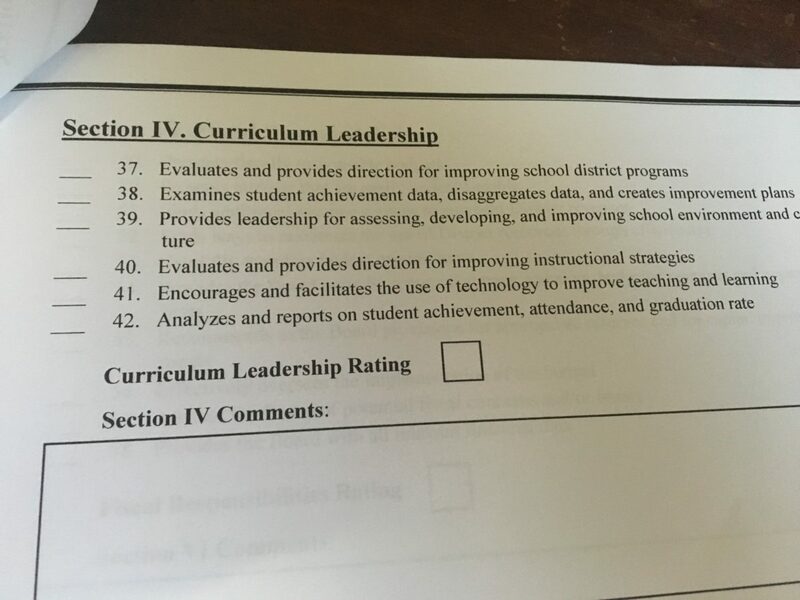 I’d urge you to take a look at some of the evaluation questions your elected board members are asked to answer on your behalf with a 1-4 rating system — prior to my marking them. Click the pictures to enlarge. 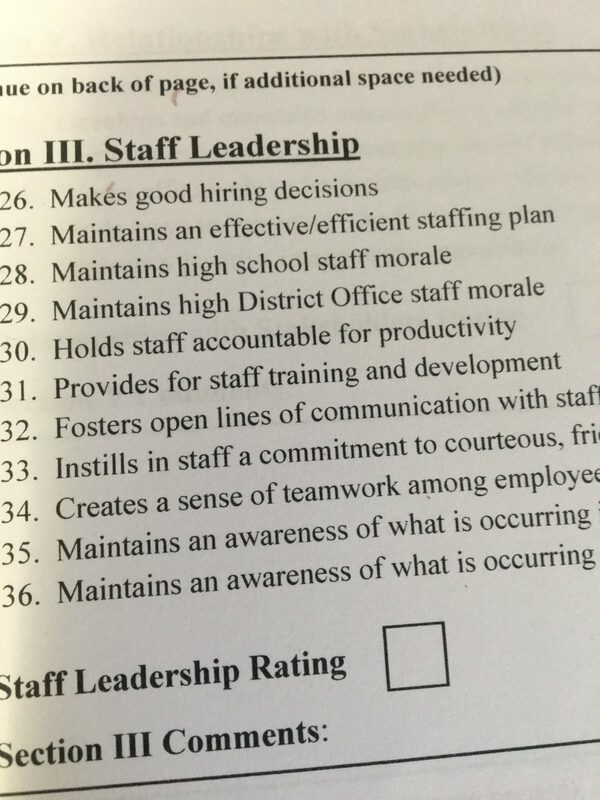 As you can see, to answer these questions with the intelligence or nuance necessary to use a 1-4 performance scale, School Board members need to have fairly extensive information about district operations on the ground. School Board members have to listen to a broad range of stakeholders; or they’re only listening to the person they’re evaluating. It’s useful to consider that fact in light of this passage from The Ledger’s interesting recent story about the overall School Board governing and election dynamics. 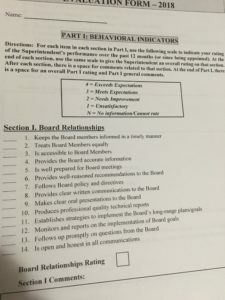 The traditional purview of the board, some of his colleagues tell [Townsend] — particularly Kay Fields and Tim Harris — is setting policy and overseeing the work of the superintendent, who works for the board. The idea here is that I disagree with that “traditional purview.” But I don’t. Rather, I believe I am living up to that “traditional purview,” where the three long-term board members do not and have not, for a generation. 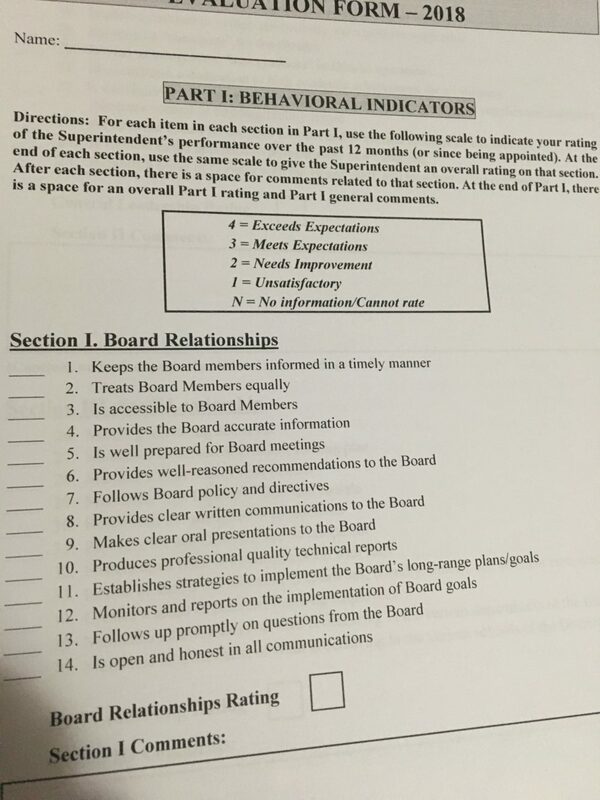 This oversight passiveness has become so ingrained in Polk School Board culture that a real effort to do the job, in a way that aligns honestly with the “traditional purview,” seems radical. But it’s not radical at all; it’s just taking the job and the “traditional purview” seriously. The School Board that existed prior to the 2016 election — including Kay Fields and Tim Harris — failed abjectly and completely to “oversee the work” of the previous superintendent, Kathryn LeRoy. It wasn’t until Greg Rivers brought a wide-ranging complaint about LeRoy’s harassment and incompetence that anything happened. It took a public revolt, which I led along with Wendy Bradshaw, to provide real oversight for LeRoy and address her deficiencies and the deficiencies of the toxic internal culture she and the previous board allowed to thrive. This timeline provides a pretty thorough account that predates even LeRoy. Meanwhile, Kay Fields sees a 30-day suspension [for LeRoy] as appropriate discipline. Anybody think that was a good idea? Do you wish you had LeRoy back? That seems like a very long time ago; but it was less than three years. I’ve been on the board less than two. We’re still in the process of changing district culture for the better. We’re making much progress in some areas and less in others. But I would argue that the vast majority of the progress made since the 2016 election comes from this reinvigorated, serious-minded approach to the “traditional purview” of providing oversight for the superintendent and setting policy. The public has raised its expectations through its votes for change. I find it extremely telling that this reinvigorated approach to the “traditional purview” is met by so much resistance and complaint from the long-term board members, only one of whom, Kay Fields, is running for re-election. Her opponent, Jennifer Sabin, offers a clear choice for generational change in her attitude and approach. 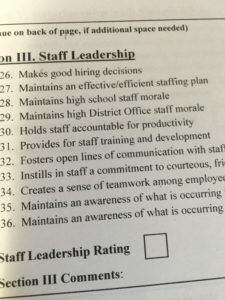 As I wrote in an article last week, the superintendent recently sent out a staff reminder with a “summary” about employee communications with the School Board. The summary misrepresented the actual policy that the School Board approved back in 2013, long before I joined the board. Note the parts in bold. Those two sentences aren’t even close. 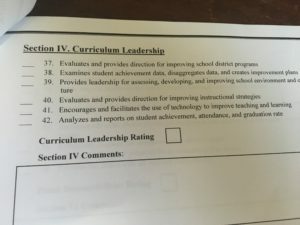 Under the “traditional purview” of the board, I believe I have a responsibility to address how the superintendent miscommunicated the School Board policy to district employees. That’s why I raised this issue at our strategic planning retreat last week, which was a very good and encouraging meeting overall. I suggested that the superintendent correct the misrepresentation of the policy in a follow up reminder to the staff. As of this writing, I don’t believe that has happened. Moreover, under the “traditional purview” of the board, I believe I have the responsibility to suggest an alternative to the atrociously-written and unwieldy communications policy that has actually existed since 2013. Accordingly, I have provided below some language and a framework to use as a starting point. It’s built around the idea of a collegial and common purpose mindset, rather than the top-down, somewhat authoritarian approach currently on the books and common to most school districts. In a district of 105,000 students, 13,000 employees, and countless public stakeholders, it is impossible and counterproductive to centralize and control how people communicate their educational and organizational experiences. Moreover, the elected School Board, which is the voice and representative instrument of the entire public, needs to hear what is happening on the ground in order to shape policy and adequately guide and evaluate the superintendent and other Board employees. Therefore, the Board places no formal restriction or condition on staff or stakeholders contacting individual board members. However, all staff members and members of the public should be aware that any written or electronic communication, including private social media messaging or text messages, sent to a board member can be considered public record if the content broadly pertains to school or district business. The Board asks that communications follow reasonable standards of decorum. Repetitively abusive or profane communication can be subject to referral to the superintendent for disciplinary review or action. But we, as a School Board, broadly trust the people of our district and community to share their thoughts, experiences, and criticisms in good faith and with common purpose. Individual Board members or the Board as a whole are under no obligation to respond to any contact from the public or staff. Board member responsiveness is a political issue, not a legal one. Voters decide the appropriate level of responsiveness for an individual board member. The School Board also recognizes that providing systemic structure and orderliness to communication will help the district function with greater efficiency, transparency, and responsiveness to concerns. So we have created several channels and mechanisms for communication within the organization itself that can be accessed in lieu of communicating with a board member. As part of reforms within HR, the district has created an intake form for “whistleblower” complaints. It is divided into two parts: 1) firsthand observations of illegal or unethical behavior and 2) secondhand information about illegal or unethical behavior that concerns the conscience of an employee. The form is designed to create succinct statement of the issues at hand and focus on fact. It is designed to separate what an employee has seen from what he or she has heard. When submitted, the form goes both to the legal department and HR. Acting in conjunction, they decide whether to move forward with a formal investigation. Because of Florida’s broad public records law, these whistleblower reports may be fully subject to disclosure. Anonymity cannot be guaranteed. And depending on the nature for the allegation, on-the-record complaints may be prioritized over anonymous submission. This is similar to the whistleblower process. But it’s focused on abusive supervisory relationships. This includes, but is not limited to, harassment or discrimination based on personal characteristics, expectation to act unethically at the direction of a supervisor, or retaliation related to the first two. Like the whistleblower process, this form has a distinct structure. It is divided into: 1) firsthand accounts of abuse the employee or stakeholder personally experienced. 2) firsthand observation of abusive behavior toward someone else 3) secondhand reports of behavior that trouble the conscience of the reporting employee or stakeholder. From there, abusive power reports follow the same process of submission and investigative determination. The same caveats about anonymity apply. It is daunting for stakeholders to navigate an organization as large and complex as the Polk School District if they have a concern or problem. Like legislators, School Board members represent the public; and it is reasonable to expect that they will exercise a constituent service function. The extent of that service is up to each individual board member; but we have created a structure designed to maximize effectiveness. That’s about as far I can get on the mechanics of constituent service. It’s an issue and structure that I will recommend for extensive board discussion after the election. Attitudes differ about the service our constituents can expect from the board members they elect. Convert a position in HR to “navigator/public advocate” who helps connect constituents to the right person or district function to answer their question or address their concern. Hire a position that answers directly to the board and performs a similar navigator/advocate role. We could convert money spent on the WE3 event each year. I think a person who is always available to help the public provides a better bang for the buck than a once-per-year expo in Lakeland, which is very far from many Polk communities. That’s good policy and PR. Work out an arrangement for sharing/divvying out constituent reports by district. This would have to be consistent with Sunshine Laws and reflect a fairly consistent approach to constituent service that I don’t think exists right now. The Board and staff talked about these issues quite a bit — and productively — at our Strategic Retreat. I was encouraged by receptiveness to the concept of “upward feedback” for leadership. And it is my understanding that some reforms related to these issues are underway from staff. But I haven’t seen anything formal yet. Hopefully the framework and language I’ve laid out here helps inform whatever reforms are already underway. And after the election, when we see who is on the board, I believe these ideas will make for a strong foundation for a new era of employee and constituent relations. In that era, we’ll ensure that “setting policy” and “overseeing the work of the superintendent” is a meaningful, productive purview, not an excuse for inattention and inactivity.